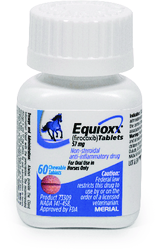 EQUIOXX® (firocoxib), is designed specifically to alleviate the pain of arthritis in horses. Firocoxib (brand names Equioxx and Previcox) is a non-steroidal anti-inflammatory drug of the COX-2 inhibitor (coxib) class, currently approved for use in horses. EQUIOXX® (firocoxib), is designed specifically to alleviate the pain of arthritis in horses. Firocoxib (brand names Equioxx and Previcox) is a non-steroidal anti-inflammatory drug of the COX-2 inhibitor (coxib) class, currently approved for use in horses. See PREVICOX® for dogs. See MAX REWARDS at Merial for great rebate information.